COMMEMORATIVE First (1st) Day Issue three (3) cent STAMP celebrating the CENTENNIAL anniversary of the first settlement in Nevada with illustration of Carson Valley, Nevada. 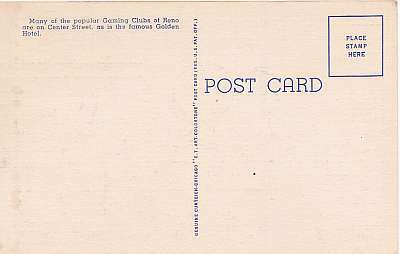 Stamp has cancellation date of July 14, 1951 in Genoa, Nevada. 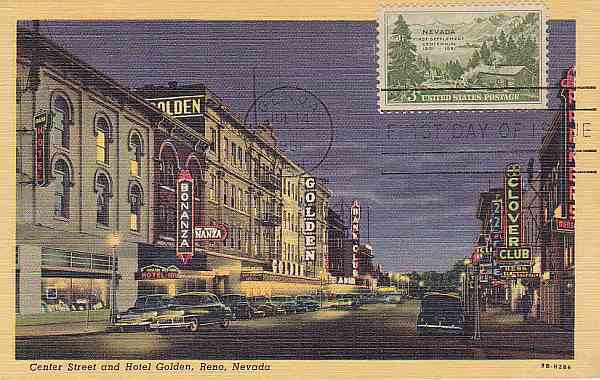 The stamp is on a vintage linen postcard of the Hotel Golden on Center Street in Reno, Nevada. Center Street in Reno is populated with many of the most popular casinos, including the Golden Hotel. CONDITION: excellent, despite minimal corner and edge wear.